In its 38-2 victory Saturday, the defense of the American River College football team allowed no touchdowns, sacking two De Anza quarterbacks four times and allowing less than 50 rushing yards for the game. ARC’s defense also forced six turnovers during the game with three interceptions and three forced fumbles, one of which was recovered by ARC. ARC held De Anza scoreless throughout the first three quarters, with a shutout only by a safety on offense that occurred early in the fourth quarter. Offensive line coach Josh Crabtree spoke on the frustration felt by not accomplishing the shut out. ARC safety Bryce Kasch, who finished the game with two tackles, intercepted De Anza quarterback Ron Johnson on De Anza’s last offensive drive of the night. “(I) just ready the QB’s eyes,” said Kasch on the play. Kasch said that De Anza tried to attack deep middle of the field on the play, but he was able to make a break on the ball and come down with it. Johnson and Kidd went a combined 15 for 44 on pass attempts for a total of 176 yards, while De Anza’s dismal running attack averaged less than 3 yards per play. Defensive back Leonard Nelson said ARC’s defense tried to key in on De Anza wide receiver Rodney McKenzie, who finished the game with eight catches for 96 yards. “We went out there and did what we were supposed to do,” said Nelson. “ We knew they liked to feed (McKenzie),” he added. ARC’s next bout will be on Sept. 19 against San Joaquin Delta College (1-1), a team that coach Crabtree knows well. “They (SJDC) have a great group of guys coaching them, “ said Crabtree. He noted that SJDC played ARC well last year and that shouldn’t be overlooked. 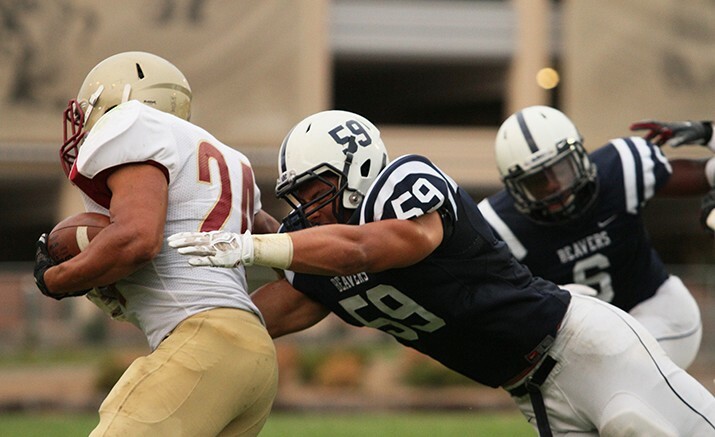 Be the first to comment on "ARC holds De Anza’s offense scoreless"